Late, though I forgot to post this here. Updated all my chars in June. Along with now, a much more significant update for Poison now in August. Grab them all in my folder. -Tweaked her Rapid Gale anims to make them less "spammy"
Get them all in my folder. No time, nor interest in doing so. -Fixed taunt bug that made the round freeze if taunting after the round was over. -Fixed a bug with her turns intro that allowed her to walk around before the match starts. Please refer to her ReadMe for info. Get her in my folder. A personal favor for my friend Dampir. Please refer to her Readme for info. Get her in my folder. By DGO and myself. Special thanks to everyone for their assistance. Refer to ReadMe for info. Get him in my folder, along with updates for all my other chars. 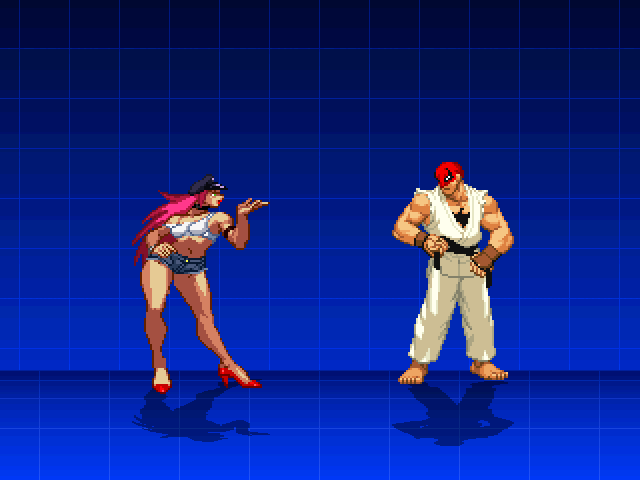 Aside from Mai, Poison, and Sagat. Which I'm still working on them. Overall the updates are misc stuff. Though one thing I feel I should mention is that for every char that has a wall bounce ability/attack, it now allows free juggling. This will remain the case for future projects as well. Please fix the posadd glitch Kyo has when performing his Lv2 or higher QCFx2 + P super when facing left. Instead of going forward he goes back(to the right) for the 2nd rep of punches.